My head feels half-empty from 4 hours of interrupted sleep, my eyes are burning, the living room is littered with play dough, a wooden train and a scooter lean against the bookshelves in the study, cracker crumbs and half-drunk glasses of juice can be found in the most unlikely places – it’s lola (grandma in Filipino) day with Leon, my nearly 3-year old grandson! But could I be any happier? As I watch him pounding the floor with a 2-ft plant stick to the rhythm of You Tube’s segment of Frozen’s Heart, for the upteenth time ( he knows how to press the repeat button on my computer), singing the last words …..bining, let it go! ...men…heart ! I can not wipe the smile off my face. Nor can I repress this unreasonable swell of love and the need to grab him and crush him with kisses. I try to recall if I ever felt this way with my own children. I must have. I look at my bedroom walls and they are filled with photographs taken in various stages of their lives. I go through their baby books and the entries I have logged in. Yes, this warm, body-crushing hug-gy feeling I did have for my children as well. The beauty of Grand Motherhood is that it brings back this once-upon-a-time part of my motherhood days. I can see beyond the teenage years of closed bedroom doors with the music blasting, the silences in their twenties, today’s … really mom? In my mind’s eye, I see myself dancing on top of the coffee table with a 3-year old Mike, whirling, singing to some forgotten song on the radio. I hear myself laughing as I catch Amanda wearing that happy, so-proud-of-myself look on the face which she has smeared generously with her nappy rash cream. The days that we spend with our grandson have made my husband and I aware of the fact that we missed so much of our children’s growing years. He was busy being a traveling salesman while I was engrossed in catching up with a career that had to be reinvented in every country we moved into. In our 30s and 40s, parenthood seemed merely a part, albeit a vital one, of the big picture. A still-life on the wall – happy couple with 2 kids, a house, 2 cars, summer and winter vacations in exciting destinations. kiss and went off to join her husband’s business dinner or the neighborhood costume party. In our 60s, reconciled to the reality of broken career expectations and thankful for having lived the “good life” of the 80s and 90s, we now have time to appreciate every new word learned and repeated over and over again, every step taken towards the actual sitting in the potty, every new antic – be it naughty or nice. Grand Motherhood is a mother’s heart’s resurrection. It brings back to life that simple, honest, unconditional love we shared with our own babies. Babies who have grown up to be independent men and women: whose “boo-boo” no longer needs to be kissed to make better; whose hands do not have to be held as they cross the street. I know that our relationship will change. It is inevitable. Until then, I will happily babysit. I will make up all sorts of excuses so that his parents will take him to our home and leave him with me for a day or two. I want to be part of his journey of discovery. Even if it means I have a messy household and a backache that lasts a couple of days. For when he wakes up next to me with a big smile on his face (after a whole night of toilet runs and replenishing of juice bottles), rolls over, cups my face and gives me a good morning hug, I know that it really doesn’t get better than this. Grand Motherhood is really all about that warm, loving feeling. Not to mention that smell that only babies and toddlers have. Even their feet smell good!! 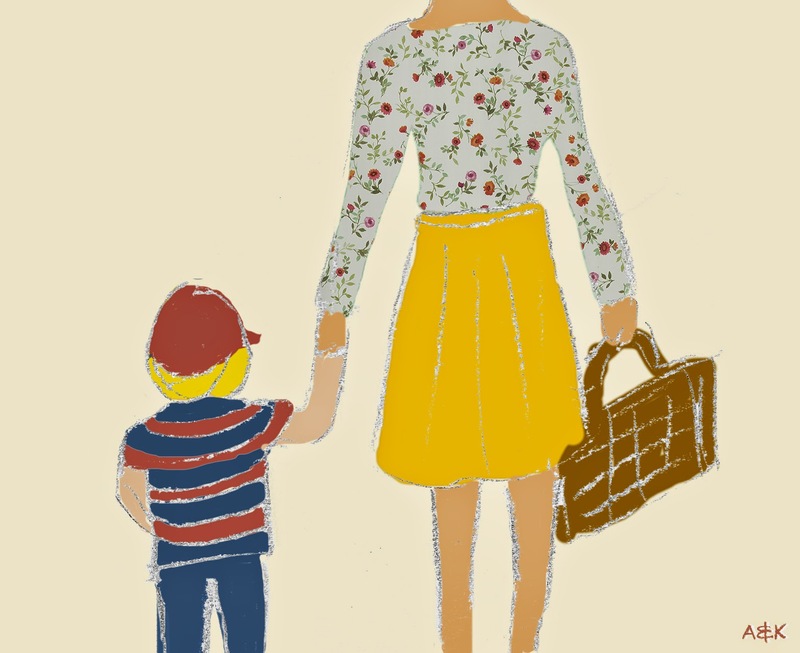 What’s the other perk of Grand Motherhood? At the end of the day (or two) you can always give them back to their moms and dads. And, in a couple of hours, your home is as good as new. Till the next visit!! And that can’t come soon enough. In a medium size wok or flat-bottomed pan, sauté the onion and garlic till soft and fragrant. Add the minced meat or shrimps. Cook till the meat is brown or the prawns pink. Season with soy sauce. Put in the carrots, then the beans, followed by the cabbage. Mixing well as you add each new ingredient. Pour in the broth. Toss the vegetables, making sure they are all coated with the broth. Cook till the vegetables are tender but not mushy. Add in the beansprouts. Mix all the vegetables thoroughly. Check the taste. Add the salt and the pepper if necessary. Pour all the vegetables into a colander. The drained liquid and any leftover vegetables can be used as broth for fried noodles! Once the vegetables have completely cooled down. You can start wrapping them in rice paper. This recipe will make at least 40 mini spring rolls! They can be placed in plastic bags in small batches and frozen. Ready for the time the little one comes to visit!! Heat ½ cup of corn or vegetable oil in a frying pan. When hot enough, slowly put in one spring roll at a time. This prevents the oil from splattering. Lay enough spring rolls to fit the frying pan. Lower the heat and allow the spring rolls to brown on one side and then turn over to brown the other side. When done, drain some of the oil by placing the rolls first on a paper towel. Serve with catsup or sweet chili sauce. Or as is. Mind you, this is the same boy who follows me around with his Bob-the-builder tool belt. Repair jobs, gardening or painting, you name it, he wants to be part of it. But not without looking at you, asking.....dangerous?? Ashamedly, I used to scoff at grandmas who boasted that 'grand motherhood' was the best thing ever! I have enjoyed my children, so why would grandchildren be better? I have to admit that I am a total convert. Like you Alma, I will drop everything to spend time with them and suffer crumbs and sticky furniture for those precious days they spend with me. Their every action and reaction brings delight and I too treasure this wonderful experience. They are truly gifts of unmeasurable value. I hope that I will still be able to connect with him when he becomes older. And me, older still!! As an expectant granddad, I hope I can look forward to the same. Meanwhile, my daughter Hannah (whom you met in Salamanca) says she's not happy about me saying that, on the scan foto , the baby looked like a terrapin. Kids today! Colin, they do start off looking like a bean - but eventually turn into beauties. And yes, Valerie is married. She is beautiful. A lovely person and treasured friend. Your writing makes your joy of Grand Motherhood so palpable, Alma. Thank you. Those are things that matter to me. I am so pleased to know that a lot of people feel the same way.